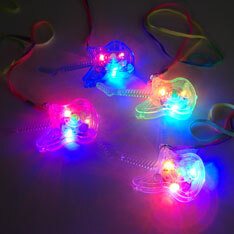 Ultra-bright multicolored Flashing LED lights in a 3 ¾ inch crystal clear guitar shaped pendant suspended from a 16-inch cord. Dazzling and spellbinding! Packed 3 dozen in a display box. Sold by the dozen. $6.50 per dozen for 24 dozen or more. $5.60 per dozen for 48 dozen or more.